Let me tell you a story. Miss M's favourite food is pinwheels (you know those puff pastry scrolls with tomato paste, ham & cheese inside?). So last week I decided - THAT'S IT!! I'm going to get some vegetables into this kid! So I sneakily grated carrot & zucchini into a batch of pinwheels for her. Unfortunately - she outsmarted me and it didn't work. She was not too be fooled! I was a really fussy eater as a child. I can remember having stand offs with my parents (and grandparents) at the dinner table on a regular basis. I liked everything plain and covered in cheese, washed down with a piece of bread. Carrots had to be raw not cooked. To get me to eat meat, I had to eat the number of pieces according to my age. At restaurants I would have a bowl of chips. On pizza night I would scrape off all the toppings and just eat the plain pizza base. I could go on and on. So it's ironic (and often James laughs at me) when I'm trying desperately to get Miss M to eat meat and veg. But we have come to the agreement to avoid have dinner time arguments because that just makes us all stressed! Bribery also doesn't work for us. Miss M is too stubborn. So I sought out some advice (and sneaky veg recipes) from my fellow Aussie Parenting Bloggers and got such a fantastic response! So there are a couple of BIG parenting blogs dedicated to this very topic and are on a mission to encourage healthy eating. Firstly, Kylie from Kidgredients. She suggested, Zucchini chippies, Coconut Vanilla Cake (with hidden beetroot) and Fuss Free Chicken Nuggets. I follow Kylie on Instagram, and she's always sharing really healthy, inventive and appetising meals in cute little lunch boxes. I'm not much of a cook myself - so I need help with finding easy recipes. Simone from Play with Food is another great source of recipes and articles. I've just stared her Happy Mealtimes eCourse - 7 modules of really informative advice. It's really beautifully presented and has given me lots of things to start implementing. (Sign up here - affiliate link). 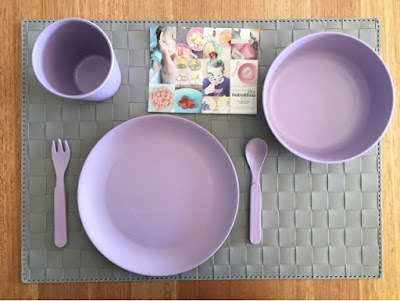 Another of Simone's posts which is so relevant to us right now - Enter New Sibling - Enter Fussy Eating - especially to prepare us all for with the Little Man starting eating solid foods. Anne from Domesblissity has compiled her own collection of 36 ways to serve vegetables. 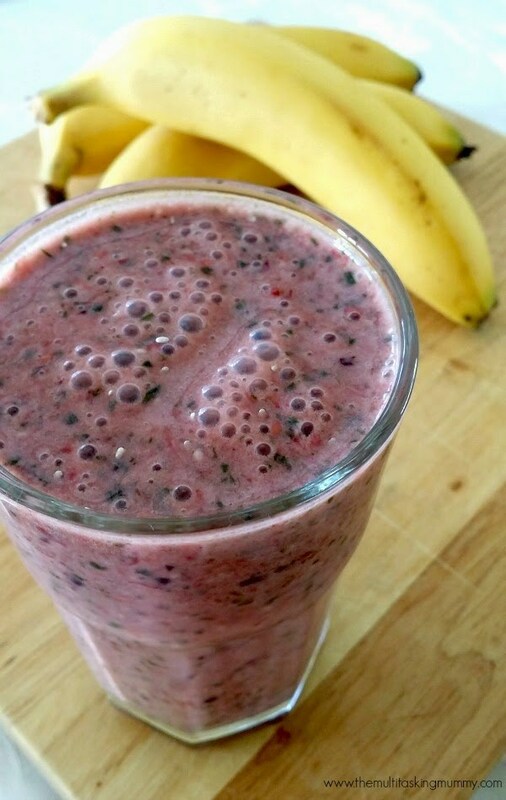 Smoothies! Why didn't I think of trying that sooner? Eva from the Multitasking Woman has 4 great recipes. 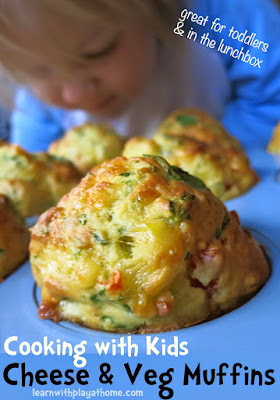 Deborah from Learn With Play At Home has 5 tips for helping children develop a healthy relationship with food and also a yummy cheese & veg muffin recipe I'm dying to try. 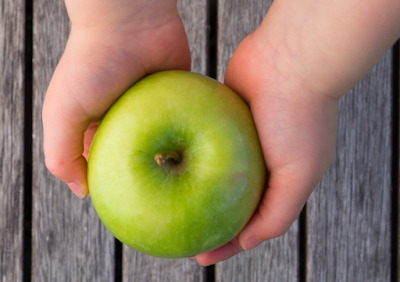 Christie from Childhood 101 has some great tips for picky eaters. AND some fun tips for encouraging children to eat vegetables. Anna from Positive Parenting shares her advice on the topic here. Sarah from Bubs and Beans has some fantastic ideas! Tegan from Musings of the Misguided explains how the phrase "You don't have to eat it" has really helped her. Shannon from Forty Up discusses her take on the Curtis Stone 'let them go hungry' controversy. 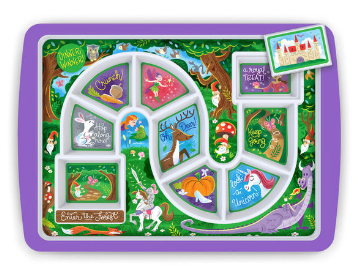 Angela from Finlee and Me has these fantastic board game type dinner plates in her online store. I'm keen to give these a try to see if it helps! She's also just launched a fantastic eBook of healthy snack ideas. I recently became a brand rep for Mr Kipp & Little Jimmy who stock this beautiful range of eco friendly bamboo dinner sets. Got it it Miss M's favourite colour purple of course - not sure how it will help her fussy eating though! Finally - if you'd like a good chuckle on this topic - you must listen to The Motherhood podcast. Lauren (from The Thud) and Jodie Speers keep it real and tell it like it his (with hilarity of course). So I now have a massive list of ideas to start trying. Wish me luck! Thanks for all your advice mummies! If you have any stories, advice or recipes to share please let me know.